Two Sumatran Tiger Cubs Pass Their Swim Test At National Zoo! While the keepers at the National Zoo in Washington DC had the new tiger cubs’ best interests in mind during their swim test, this adorable video demonstrates that no one likes being unexpectedly thrown into a swimming pool! Born in August, the time for the brother and sister Sumatran tigers (Bandar and Sukacita) to make their public debut in the zoo’s main tiger enclosure is quickly approaching. Before the rambunctious tigers are let loose into their new home, zookeepers decided to play it safe by dropping the pair into their concrete moat to see if they would be able to easily swim and climb onto dry land. Safety first! 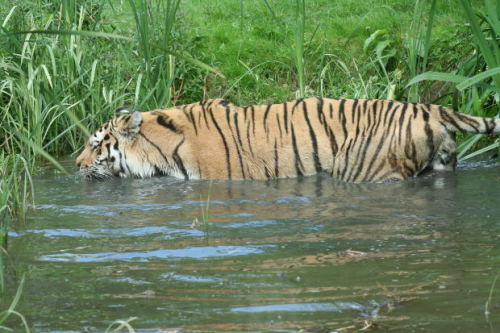 Note that Sumatran tigers are excellent swimmers and that they love taking a dip, but seeing as this was the first time that the cubs experienced their private pool, and that they were unceremoniously plunked into the drink, neither one seemed to appreciate their mandatory swim test. The good news is they both passed with flying colors, and that Bandar and Sukacita are on schedule to officially move into their new enclosure on November 18th. The intense interest in the recent birth of the cubs goes beyond their inherent cuteness, as researchers estimate that there are only a few hundred of these tigers left on the island of Sumatra. 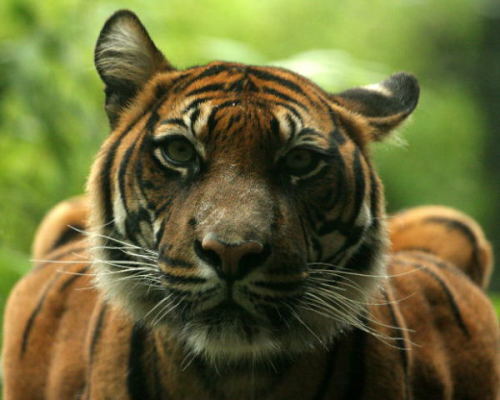 If Sumatran tigers can be bred in captivity, there may be hope for the future of this critically endangered species. In the meantime, enjoy this video of the grumpy and soggy baby tigers! Llama! The Animal Video of the Day!!! Panda Play! The Animal Video Of The Day!!! Watch What This Bear Does... The Animal Video Of The Day!!! Cute Bear Attack -- The "Just Wait Until He's Older" Animal Video of the Day!! !